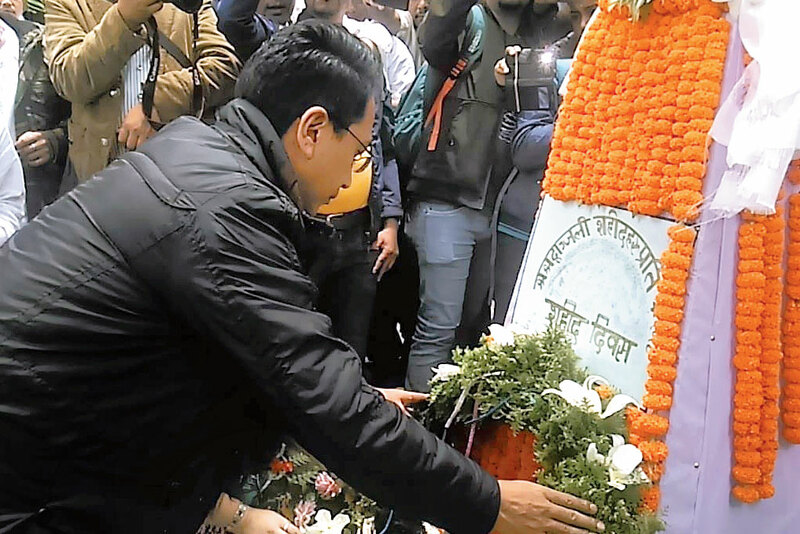 Darjeeling: Arch-rivals Gorkha Janmukti Morcha and Gorkha National Liberation Front on Friday held events to commemorate martyrs day, only to trade salvos over using the martyrs' families to gain political mileage. Martyrs Day is observed on this day to pay obeisance to those who laid their lives during the Gorkhaland agitations - one started by the GNLF in 1986 and two subsequent phases spearheaded by the Morcha from 2007 onwards. Addressing the gathering at the martyrs' column at Gorkha Rangamanch Bhawan premises, Morcha president Binay Tamang said: "Leaders should stop using martyrs for publicity stunts." Tamang was referring to GNLF president Mann Ghisingh's recent visit to the Pulbazar area where he visited family members of those killed in the last year's agitation and his desire to set up martyrs' column for their families, as requested by them. Addressing GNLF workers at about the same time at the party office in Darjeeling, Ghisingh said: "Martyrs families should stop being used as tools by political parties. They should not attend political functions and instead make the leaders come to you and hear you out." Tamang spoke for about 20 minutes while Ghisingh delivered his speech for nearly an hour. Both speeches had striking similarities. Tamang spoke of the problems brought about by the Indo-Nepal and Indo-Bhutan treaties, and so did Ghisingh. Both leaders are of the opinion that the problem of "identity" of Indian Gorkhas stems from the provisions of Indo-Nepal treaty that allows free movement of citizens of India. The leaders were also of the opinion that there should no longer be violent agitations in the hills and the issue must be pursued through dialogues. "We should no longer have more martyrs from the place," said Tamang. Both leaders said the Centre had not been sympathetic to the cause of a separate statehood. "The hills are talking about Gorkhaland since 1986 and the Centre has to speak," said Ghisingh, almost echoing Tamang. The GNLF argued that given political situation, Sixth Schedule status, which allows more autonomy, for the hills was the best option. The GNLF, however, complained that they were not allowed to hold a function at Sonada. Ghisingh urged supporters to commemorate the day again on Sunday. The administration, however, did not allow either party to hold any event events at Sonada. GNLF wanted to hold its function at a martyrs' column erected in memory of Tashi Bhutia, who died during last year's agitation. 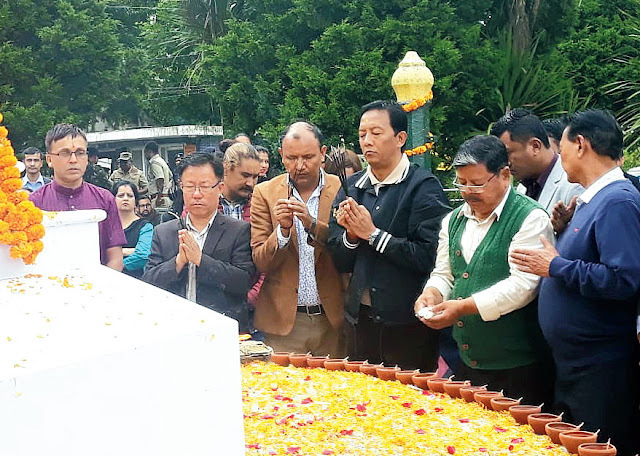 Arch-rivals Gorkha Janmukti Morcha and Gorkha National Liberation Front on Friday held events to commemorate martyrs day, only to trade salvos over using the martyrs' families to gain political mileage.